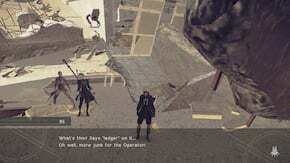 Data Analysis Freak 2 is a Side Quest in NieR: Automata. "The data-loving Operator 21O has forced another request on you. Check your mail for further details." "The mail contained a new request for intel gathering. Head to the apartment complex in the desert to find traces of humans' daily lives." "You collected remnants of human society from the apartment complex, after which Operator 21O's analysis revealed that they used to live in groups called "families"." "Operator 21O talked.... and talked... and talked some more... before suddenly ending communications.Make sure to claim the reward she sent via email"
Go to Desert: Housing Complex. Pick up the items in the marked area. This quest becomes available on your second playthrough, when you are 9S. Go to Desert: Housing Complex. and pick up the items in the marked area: Accounting Book, Broken Toy, Small Shoe. If you are having trouble finding the items, equip the HUD: Items chip to have them show on the map. The quest will auto-update with a call from Operator 21O, who hints at wishing she had a family, but ends communications. After completing the first quest make sure you transport to any location on the map and then check the Inbox via an access point for a message from Operator 21O to get this quest. If you still do not receive a transmission from Operator 21O simply go to the Resistance Camp and leave the area to get the quest. All I wanted... was a family.. If you&apos;re having trouble getting this one on chapter select cleanup, go to the first part of chapter 6 and teleport to the resistance camp. Then just walk over to the robots outside the camp and you&apos;ll receive the mission.